These prestigious awards recognise every aspect of housebuilding — from one-off houses to major developments, interiors to landscaping. The awards ceremony was held on Thursday 20 September at the London Marriott Hotel in Grosvenor Square. Bishopstoke Park was nominated for The Best Community Living award which acknowledges exemplary new developments that integrate resident amenities and create a strong identity. 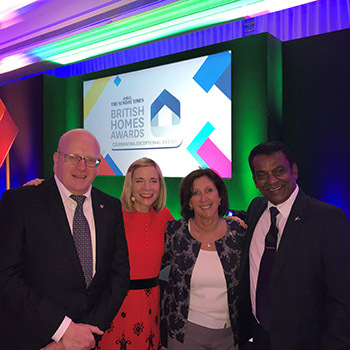 Nalin Weerasekera, Anchor's Regional Sales Manager for New Developments, who attended the event said: “Bishopstoke Park is Anchor’s flagship retirement village and we are hugely proud to be a finalist in these prestigious awards. Bishopstoke Park retirement village offers a range of beautiful homes, state-of-the-art facilities and a vibrant community set in the historic parish of Bishopstoke. Phase 2 apartments are now available. Find out more about Bishopstoke Park here.